Riding into this title, I wasn’t sure what to expect. 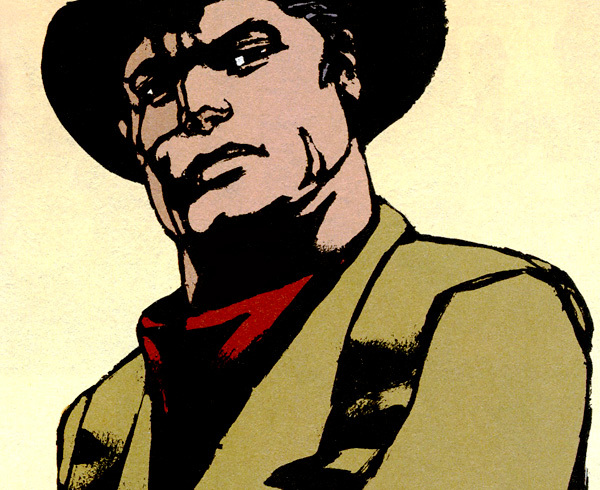 The last Vertigo western we looked at, the 1993 Jonah Hex series, highly reviewed on Amazon, was a bit of a let down. This book, collecting the 2001 El Diablo miniseries, is another riff on a Bronze Age cowboy, featuring a team I was only half familiar with. Brian Azzarello has produced some work I loved, and some writing that was a little underwhelming. He seems to work best in the minds of criminals. Danijel Zezelj is a Croatian artist whose work I’d never seen before. So I admit to opening the book with some trepidation. It completely won me over. It feels like the creators were given a great deal of freedom by editor Alex Alonso. 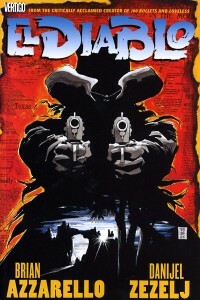 As I mentioned, Azzarello is most well known for gritty crime drama. This book, while on the dusty plains instead of hard asphalt, plays to his strength – a grim, dark tale of twisted loyalties, hidden motivations, brutal violence, and like many Vertigo titles, just a hint of the paranormal. 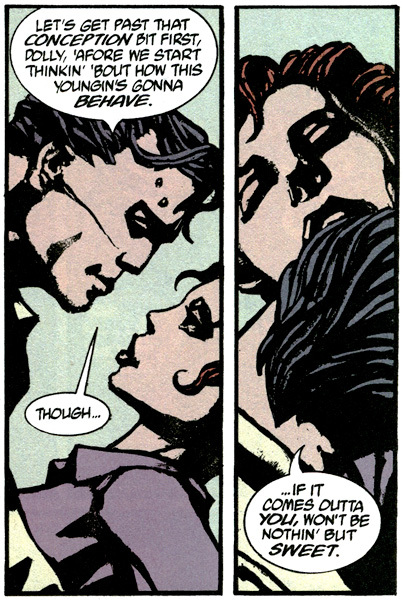 Azzarello is on top of his game here, with easy flowing dialogue and seductive characters. Things start straightforward enough, in what seems to be a standard western set up. Our hero, Moses Stone, has left behind his hard life as a bounty hunter in order to be sheriff of a sleepy town. He’s got all the dressings, respect, the love of his wife, and a hope for children on the horizon. Of course, things get dark quick. Then they get darker. Since much of my enjoyment of this book rested on unexpected twists and turns, I won’t discuss the details. 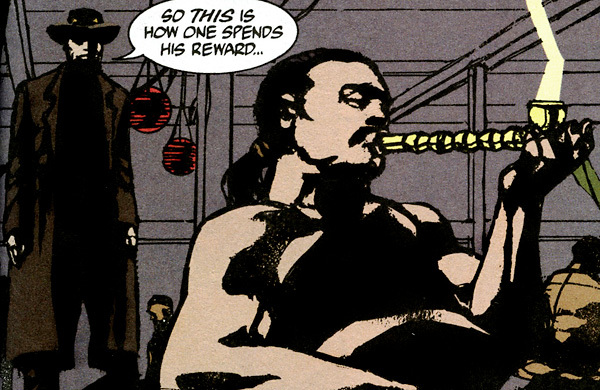 El Diablo, here, is not as literal a reinvention or character as he is in other series. I admit to not knowing as much about him, due to his past stories being uncollected, but here he is the framing for a story that stands very well on its own. As such, it can easily be read without any prior knowledge of the character’s history – and shouldn’t have any negative impact on any future appearances. This kind of interpretation is exactly what I like to see from Vertigo books. It’s respectful of the existing history while offering an original story worthy of attention. 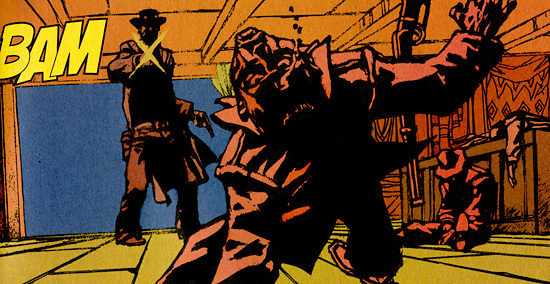 While the Jonah Hex book twisted the character to fit its style (which was unfortunately not too successful) Azzarello writes a Diablo just fleshed out enough to bring weight to the story without being a crutch. I did notice that the the dialog didn’t always feel as authentic as some other western writers – the cowboys here seem to have just a hint of modern day gangsters to them. This isn’t really a complaint, since the world fully fit with this interpretation. If anything, it implied enjoyable parallels. Obviously the author feels that crime, and the dark lives of bad bad men, just doesn’t change much, regardless of the setting. He may have a point and I’d be willing to read a Stone Age or Renaissance story of sin if Azzarello is at the helm. The other star of this book is of course Danijel Zezelj. When I first flipped through the book, I was struck by how unfamiliar the art looked. As with anything new, I was worried I might end up hating it. But while blocky and unfeeling at first glance, Zezelj’s work soon revealed itself to be very expressive and surprisingly subtle. 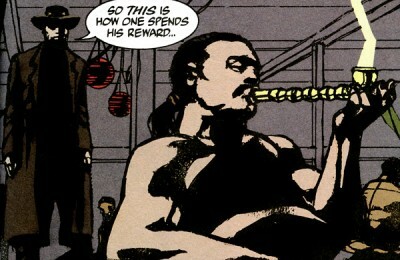 He can render the quick snap of violence with the best of them, but his quiet moments are some of the best. Like a good western film, the soft quiet may hold more meaning than the shattering gun shot. It’s in that moment before the draw where you might find measure of the man. I think what threw me at first could have been the printing of the pages. Zezelj likes thick lines and deep swaths of black. His backgrounds are minimalist, setting the stage with color (by Kevin Somers) more than detail. Since the paper in this volume is a simple matte, my initial glances weren’t grabbed by high contrast. I’m not sure if the original issues were printed on glossy stock or not, but it’s possible such paper would allow much deeper blacks and give a different feel to the art. As it was, I soon had no problem with the printing – again, subtlety here. The book’s a slow burn, and the violence felt subdued but inevitable. Somehow I managed to be totally surprised by sudden turns resulting in brutal displays. There’s the cold emptiness of a killer looking back on his deeds, knowing the events that brought him to this point, but never quite comprehending the meaning or consequences. It may seem obvious, but I feel I should mention it expressly: while not x-rated in any way, this book is definitely for mature readers. El Diablo is a tightly plotted and executed book, a bit of horse opera noir. As a downward spiral, it’s one of the most enjoyable ones I’ve had the pleasure of observing. 5 out of 5. I could find very little wrong with this book. 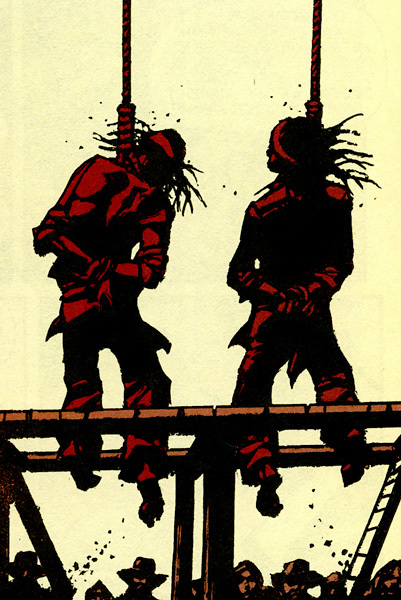 Azzarello is at his best here, crafting a near Shakespearean tale of tumbleweed treachery. Well, a lot less long in the tounge – cowboys aren’t known for excessively poetic soliloquy. Zezelj accompanies this with thickset stylized art that I’ll be sure to look out for in the future. Bit of a side note, there are some really nice Tim Sale covers reproduced here. It’s a subtle nod to past DC properties while being completely self contained. It may not be essential to us continuity nerds, but I don’t recommend skipping it. There’s no essential books to read before this one, but you can take a look at the DC Westerns list (which I just created) if you’d like. Azzarello and Zezelj team up again during a run on another Vertigo western, Loveless – a 24 issue ongoing no doubt awarded for their performance here. I’m now excited to track down some copies of those trades, and if possible, place them in the DC Reading Order. For more of Azzarello’s work, check out his critically acclaimed self contained Vertigo title, starting with 100 Bullets Vol. 1: First Shot, Last Call. If you’re looking for something in the DCU, I previously talked up his Lex Luthor: Man of Steel original graphic novel. Another good review, and if you enjoyed this you will enjoy Loveless as well. 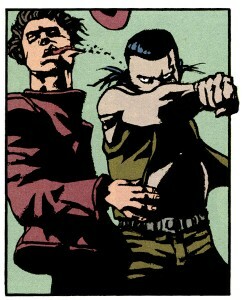 I love the characters in Loveless, especially Wes and Ruth, but I feel the series trails off in the third trade. I hope you enjoy your trades when they arrive. Also keep your eye out for Luna Park as well, very well written and the art by Zezelj is top notch again. This is great review for another great comics book. You know what I would love, a collection of the early 90’s El Diablo…Mike Parobeck (RIP) art…the always underrated Gerard Jones (we need The Trouble With Girls back, STAT! )…you know, back when comics were FUN. I’d like to see them collect the character’s roots as well, to go nicely with the Bat Lash and Hex showcase trades.